The final leaders' debate had been billed as the greatest story ever told, but ended as the greatest story never told, writes former TV executive Peter McHugh for Channel 4 News. We had been promised fireworks, but there was more damp squibs than bangers. We had been promised substance not style, but as befitted the town where just last Saturday the first auditions for the X-factor were held, we had the final heat of a beauty contest. The Final Debate, as it was otherwise known, was held in what looked like a rather grand church hall. There were so many elephants in the room it would have been safer to hold it in London Zoo. But don't worry, none of them were let out. 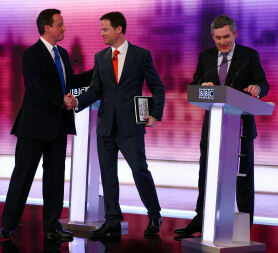 - Time for Cameron to cosy up to Clegg? We were told the nation would be gripped by this, the final showdown. It would be the Gunfight at the Ok Corral and High Noon wrapped up together. As it was the great British public voted with their remotes at 8.30pm. Some six million watched the great debate on BBC1, 6.5 million watched Coronation Street on ITV. For those who want to know Dave won - by a whisker if you read the Independent, by a landslide if you prefer the Sun. But we were not there to see the boy David or his fag Nick. The debate began with some confusion. You knew it was important because David Dimbleby was there. As befits his stature as a figure of some national importance, you weren’t quite sure at the start of the 90-minute drama that he was not a late contender for the prime ministerial post; and you could see he was not quite sure too. As it was, he had his own lectern and gave off the self-confidence and urbanity that the other three could only dream about. Sadly his name had been left off the ballot. Oh and yes there were three candidates there - the two would-be-winners and Gordon Brown. Not present was the person whose name was on everyone’s lips, whose decision to pop out on Wednesday morning for a loaf of bread will be a set text for politics students for years to come. The granny who turned the old adage " P Duffy.< Gillian Rochdale? : in time long a is minute ?a into politics?, week> No she was not there but Gordon, her new best friend was. In fact there were two debates on in Birmingham last night. The first involved Cameron and Clegg for the position of PM - Gordon wasn’t really involved in that. The second and for some the more important debate was who will be the leader of the Labour Party and Gordon was not involved in that one either. That debate had kicked off earlier in the day when Home Secretary and heir apparent Alan Johnson had rushed to the airwaves to defend Gordons’ Great Gaffe. Mr Johnson, if you remember, was the first Labour biggy to say he would have no problem working with the boy Nick. He did not say he had not come to bury Gordon, but you could hear the sound of the shovels in the background. Et tu Alan. And so there stood the man alone, all of that in his mind, on what should have been his night. He did not even wear a red tie as if to indicate the start of the process of withdrawal that will end with a removal lorry outside the back door of No. 10 in just seven days time. He had waited the whole campaign to get onto his specialist subject - the economy. Mauled maybe, tired definitely, the old bruiser was actually at his best compared to his two previous appearances, but all to no avail. The polls might not have agreed on the size of Cameron‘s victory over Clegg, but they all agreed that Gordon was so far behind that the other two would have been back in the changing rooms, had their showers and gone home before he came in. The debate itself was no eye opener. For the first 30 minutes you thought Dave and Gordon had drawn up their own pact to keep Clegg minor out of it by ignoring his presence. The two aspirants to the throne had the advantage of knowing Brown was probably fatally wounded before he mounted the stage but he didn't go down without a fight. His charge that the Tories were going to give the richest 3,000 people in the country a handout of £200,000 each through their inheritance plans had Dave, who we expect might know quite a few of them personally, squirming. But that was just a little of the light on the night. The game was given away by Dimbleby, banned by the rules from interogating his guests. At the end of every alleged answer he simply repeated the question making us all aware that facts were off the menu. “Tell us about your plan for cuts”, said one questioner. “No bloody chance“, was the short form reply, although it took ten minutes of mumbo jumbo to say it. But of course what everybody was really waiting for was the “I“ question. Would immigration grab Gordon by the throat again? Would he make his much trailed public apology? Will that be the epitaph on his political grave? As for the others, Dave had obviously been told to look serious, only slightly spoilt by an excess of pan stick leaving his chin shining like a beacon. Clegg minor was as excited as a boy on the last day of school, having won the book prize for public speaking. But they go on. In just seven days from you reading this, CamCam, SamCam and the little Cams could be on the front step of No. 10 promising good, if tough, times ahead. As for Gordon, he can only wish he’d had the luck of his bête noir Teflon Tony. Or is there a final twist? Mervyn King, Governor of the Bank of England, says whichever party wins the general election will have to take such strong action they will end up being out of power for a generation. Was that Gordon’s secret plan all the while? The debating is now over, he said this morning. "Thank god", he probably said last night. By the way it’s your turn with Jeremy Paxman tonight.